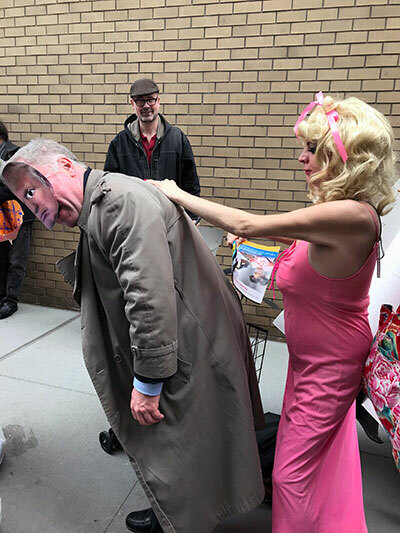 New York City’s 33rd Annual April Fools’ Day Parade (and 2nd Annual Trumpathon), once again gave the world an opportunity to laugh at the folly of mankind. 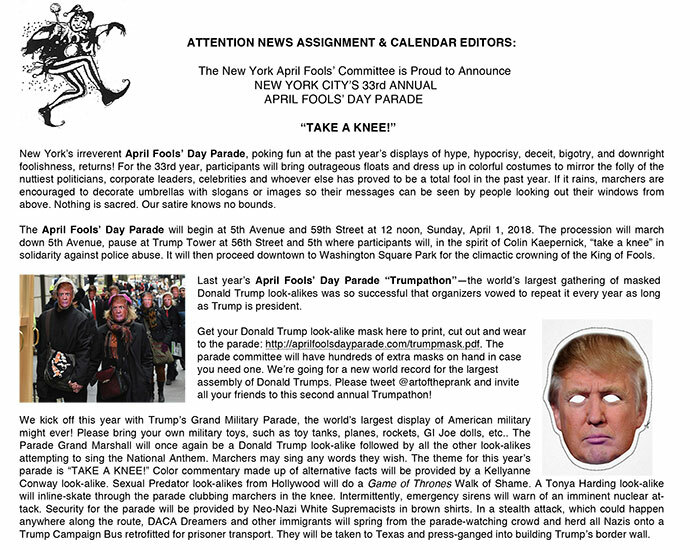 Here’s a snippet of the parade press release. Read the whole release here. 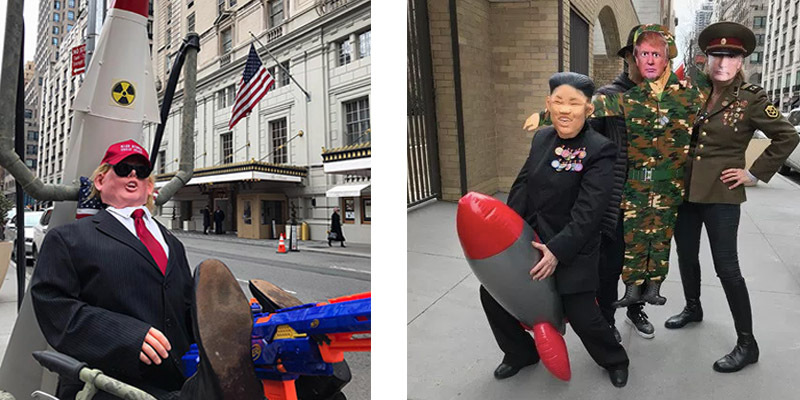 The parade kicked off with a satirical take on Trump’s extravagant, expensive and unnecessary Military Parade. President Trump sat astride a tricycle-mounted sling-shot launcher with a 10 foot tall rocket. He was joined by North Korean “Rocket Man” Kim Jong Un and Russian President Vladimir Putin and a battalion of Trump look-alikes. Even Stormy Daniels was there to spank Trump’s behind with a magazine featuring him on the cover. 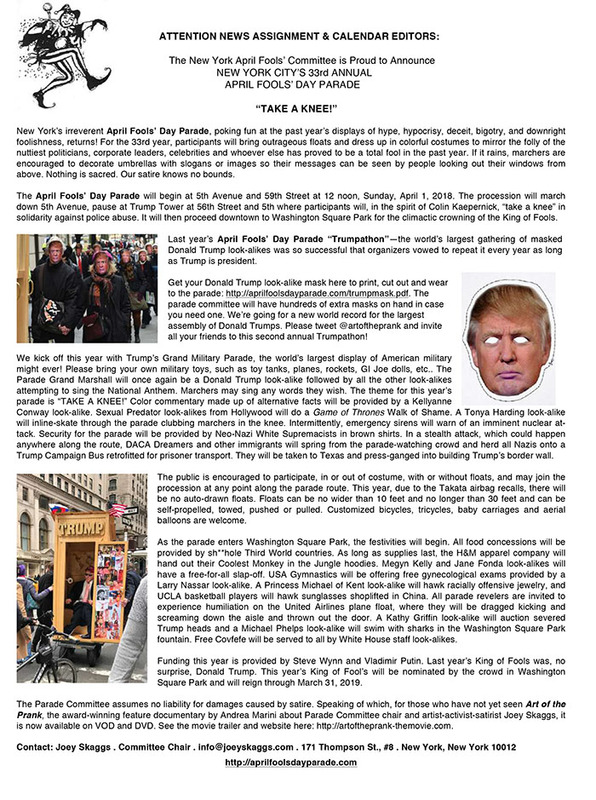 During 2017’s 32nd Annual April Fools’ Day Parade, parade organizer Joey Skaggs vowed, “As long as Donald Trump is president, we’ll hold an annual “Trumpathon” as part of our April Fools’ Day parade. 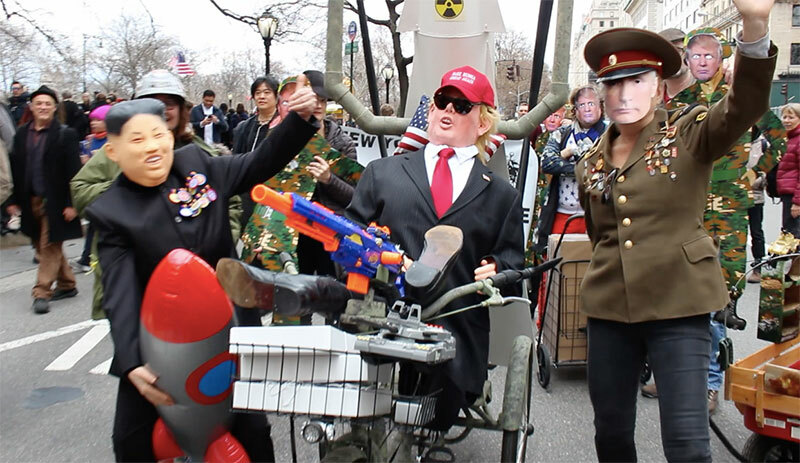 For 2018, parade revelers wore Donald Trump masks and brought their military toys. Marching down 5th Avenue from 59th Street to Trump Tower at 56th Street everyone sang the National Anthem as best they could. The entire parade took a knee in solidarity with football quarterback and civil rights activist Colin Kaepernick at Trump Tower. Because April Fools’ Day fell on Easter Sunday, the parade coincided with New York’s Easter Parade. 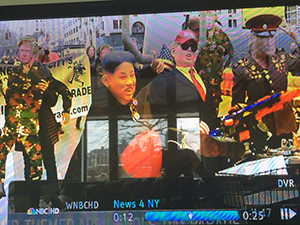 So, paraders in outrageous Easter bonnets hilariously intermingled with Trump look-alikes. A squad of police officers assigned to protect the military paraders offered to safely take them wherever they wanted to go. Visit here for more photos.